As noted here, Maj. Gen. John Toolan turned over the reins of Regional Command Southwest yesterday to Maj. Gen. Charles Gurganus, who will lead Marine forces in Helmand and Nimroz provinces this summer. Toolan has repeatedly praised Mohammad Gulab Mangal, Helmand’s provincial governor for his leadership. The general cited Mangal jumping to action as one reason why Helmand didn’t have the same kind of violent protests other parts of the country did after U.S. soldiers burned Qurans at Bagram Air Base last month. To thank Mangal and other top Afghan officials for their year-long partnership, Toolan held a farewell dinner last week at the Afghan Cultural Center at Camp Leatherneck. 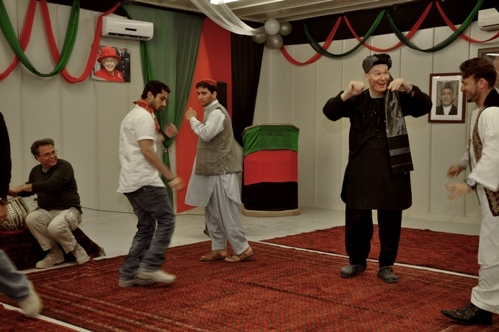 And as you can see in the photograph above released by the Corps, the general threw himself into the mix completely, dressing in traditional Afghan garb and joining others on the dance floor. I’d reckon a guess that it’s this kind of familiar relationship that helps on tough days when top Marine and Afghan leaders must circle the wagons. 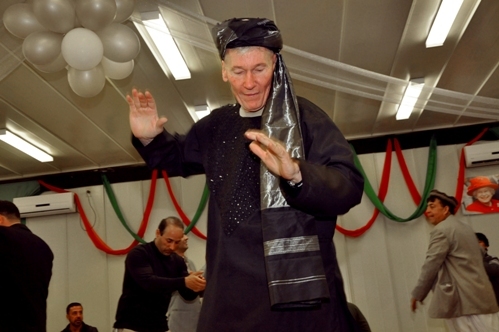 What a shame, a USMC Major General dancing around in a Turban acting like an idiot. Chock another embarassment up for the Corps. This is my leader in Afghanistan, what a disgrace. What are you going to do about this General Amos. If this was a junior Marine (enlisted) im sure he would be reprimanded…This is where our tax dollars go to,WOOOWWWW what has this Marine Corps become, how sad!!!! What a shame A USMC Major General dancing around in a Turban acting like a idiot, how embarassing for Corps. This is our leader in Aghanistan. What a disgrace Toolan should be ashamed of yourself. What are you going to do about General Amos? IF this was a junior enlisted Marine he would be reprimanded or brought up on charges. What a disgrace!!!!! What a shame. Just another embarassment to Corps. Think im going to throw-up. This is truely sad. You should be ashamed of yourself Toolan. I see the MG likes himself a lil bacha bazi! Was this a Thursday night? Toolan should have joined the Navy….F’ing embarassing. Just when the Corps couldn’t suffer anymore embarassment MG Toolan pulls this crap. You gotta be kidding me. What a joke. The Marine Corps is going down the tubes fast!! !Disgraceful and outright stupid. Hope retirement is right around the corner for this clown. (SHAMEFUL to say the least)!!!!! Just another glaring indication of just how far off track this country and it’s leadership is. A Major General in the Marine Corps should exude Force vs farce, Power vs puny, Danger vs dhimmitude! And to add insult to injury, our Warriors have to endure to inanity of this leadership while left to die on the plains of Afghanistan!! God help this nation!! 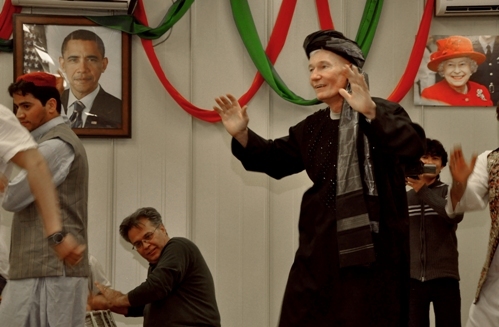 The Commanding General dresses up to the delight of Afghans, takes part in some Afghan dancing, again to their delight, is seen to embrace Afghan culture by a great many influential people, and there’s next to nothing but criticism? Events like this, and individuals like the General who can genuinely reach out to those with whom we deal are a massive bonus.